When you get invited to a work event, it’s important you know how to dress appropriately. Whether it’s a holiday party, a networking event, or even a corporate event, which Damon Guidry, Global Event Strategist at Adobe, says “help engage employees… and make the places they work a more interesting place to be”, you should always dress to impress. So if you’re new to navigating the world of work events, here are a few simple tips that should help you choose the perfect outfit. Ready to be dressed for success? Try these tips. If you are told the work event has a dress code, it’s essential you know what it means. For starters, a casual dress code means you can wear whatever you want, within reason. You still want to dress appropriately but you can let a bit of your own fashion sense show. If the dress code is business attire, you want to wear something that you could also wear to a meeting with a client; something that is work appropriate but can be dressed up too. For a cocktail dress code, wear something you think is too fancy to wear to work, like a short, black dress. And black tie dress code means you have to get dressed up. Wearing a nice dress and comfortable heels is a good formal option for work events. Knowing which dress code means what is key to dressing appropriately. Most work events involve you standing or walking around to talk to different people. This is why it’s so important to make sure you dress comfortably. And if you fell victim to making one of the 16% of unplanned purchases encouraged by a display noticed while shopping, you probably have a few items in your wardrobe that aren’t comfortable or that don’t fit right — these are the items you do not want to wear to a work event. This is especially true if you’re working all day and then going to the event immediately afterward. So keeping comfort in mind, make sure you wear shoes that won’t be painful to walk in or give you blisters. Additionally, make sure you dress in layers so you can add or remove clothing if you get hot or cold. And make sure your clothes are comfortable to move in and aren’t restricting. This way, you can sit, stand, and walk at the event without any issues. One of the best ways to ensure you’ve dressed appropriately for a work event is to think about who your audience is. Are you going to a casual party with just your coworkers? Or will there be people from other businesses and potential clients there? Your outfit should reflect the vibe of your audience. Dressing more conservatively, fun, or fashion-forward may depend entirely on who else is going to be at the event. Thinking about who you’re going to interact with is going to guide you in choosing the right outfit. With the number of fashion consumers being predicted to increase to more than 1.2 billion before 2020, there are a lot of professionals of varying titles always on the lookout for the perfect work event attire. 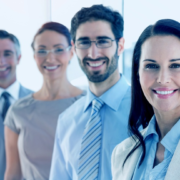 So for your next work event, keep these tips in mind to ensure you’re dressed for success. 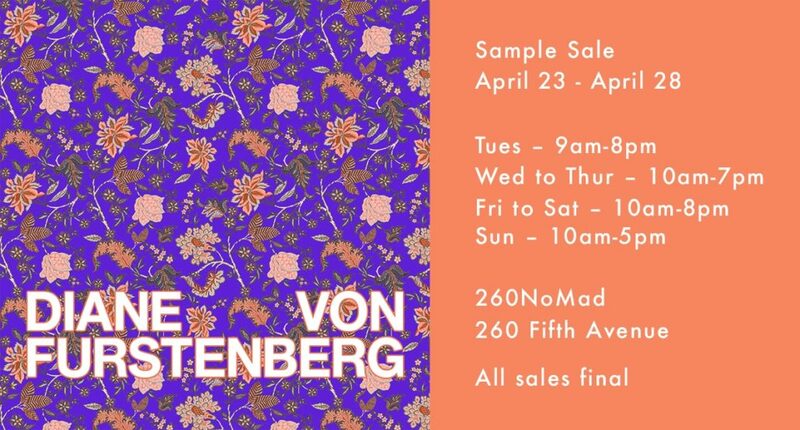 Tis the season of spring sample sales and many are already in full swing. 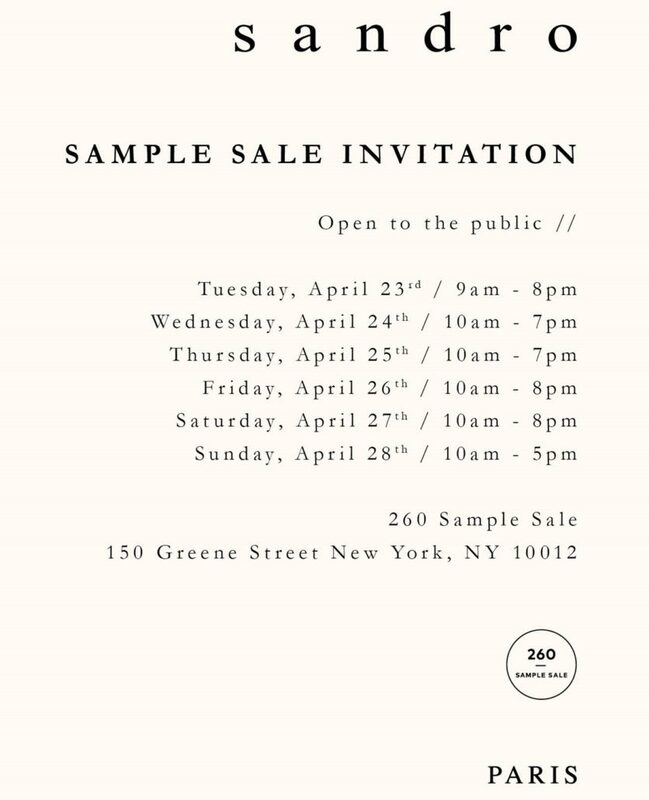 Here are a few of the current and upcoming New York sample sales happening in NYC from 260SampleSale. We strongly believe in the rule of never paying full retail, and we’re sure you to do. 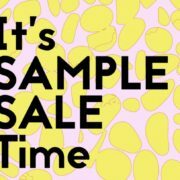 So keep reading on for several fantastic sample sales from some of the most wonderful designers. 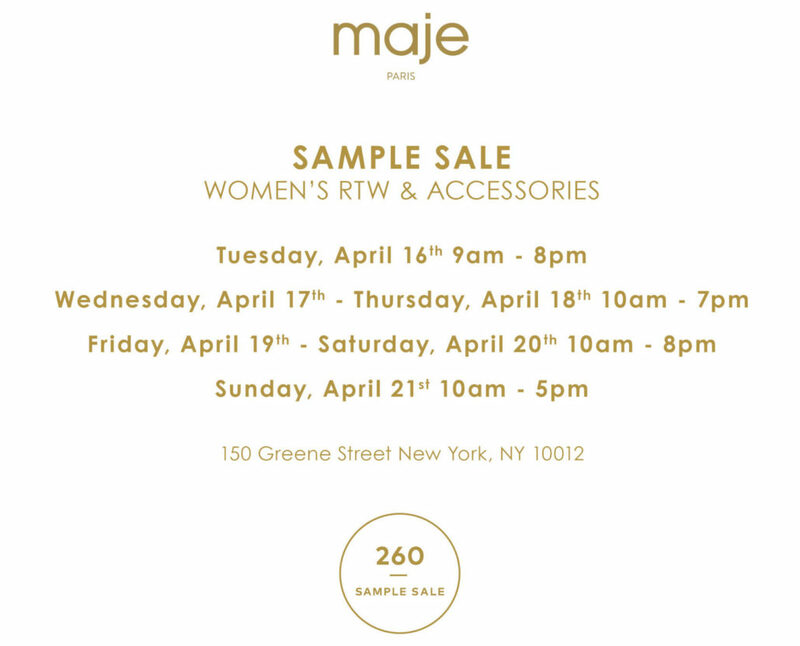 We’re sharing sales from Maje, Marissa Webb, Sandro, Derek Lam, Diane von Furstenberg, and more. The French women’s ready-to-wear brand will have their signature delicate blouses, folk-rock shirts, cashmere jumpers, and ethnic-inspired accessories t prices far below retail. Shop discounts on candles, diffusers, and perfumes, as well as the reusable and sustainable bottles from S’well Bottle! 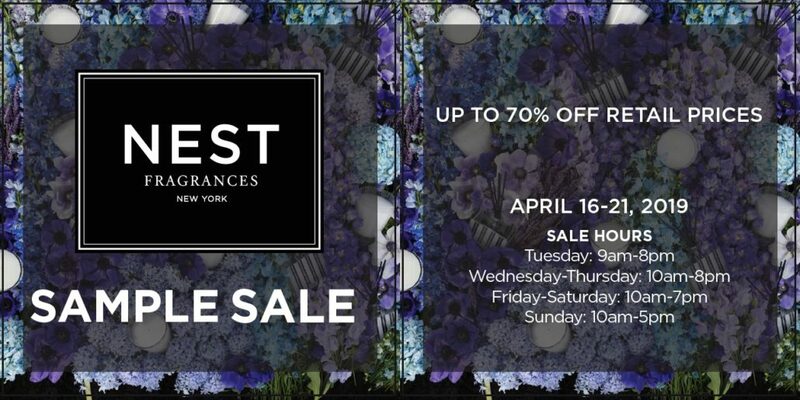 Shop women’s ready-to-wear apparel, pajamas, and intimates, plus accessories from Eberjey, Marissa Webb, and Apparis at up to 75% off retail prices. Shop discounts on Men’s and Women’s Apparel & Accessories from this French clothing brand that offers chic, visually striking pieces, impeccably cut and fitted suits, and modernized vintage styles. 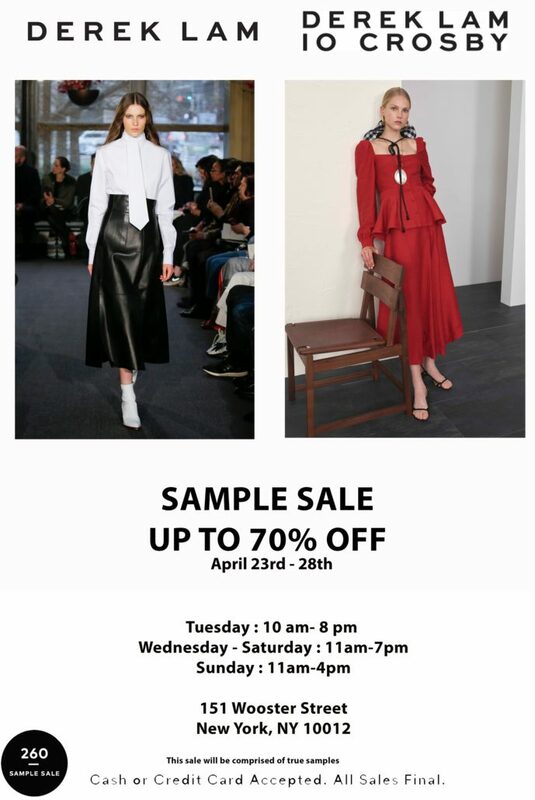 Shop true samples including women’s ready-to-wear, shoes, and accessories from this incredible designer, at up to 70% off retail. Known for his luxurious and wearable fashion, with a feminine and unfussy feel, You’ll definitely want a closet full of this luxury brand. Get your hands on offerings from Diane von Furstenberg’s full collection of ready-to-wear, shoes, and accessories. Go home with some of her iconic wrap dress and signature prints at prices far below retail. 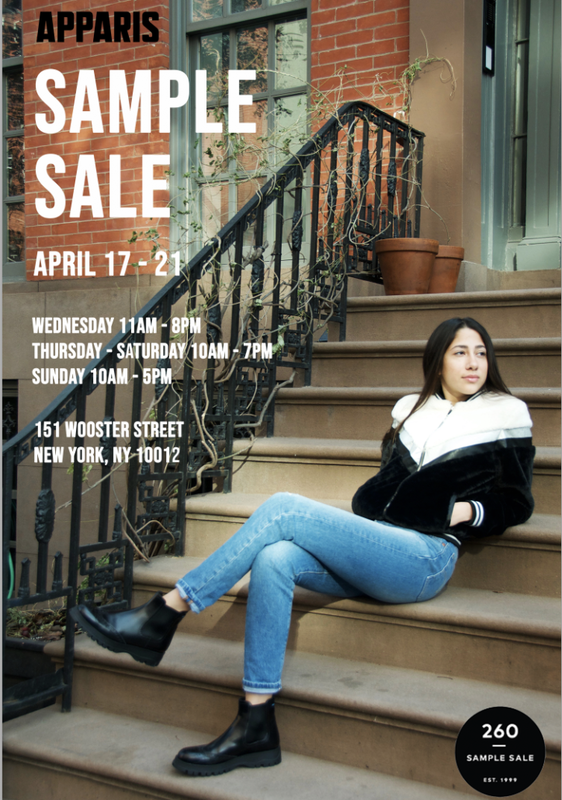 Mark your calendars for some non-retail priced, retail therapy. 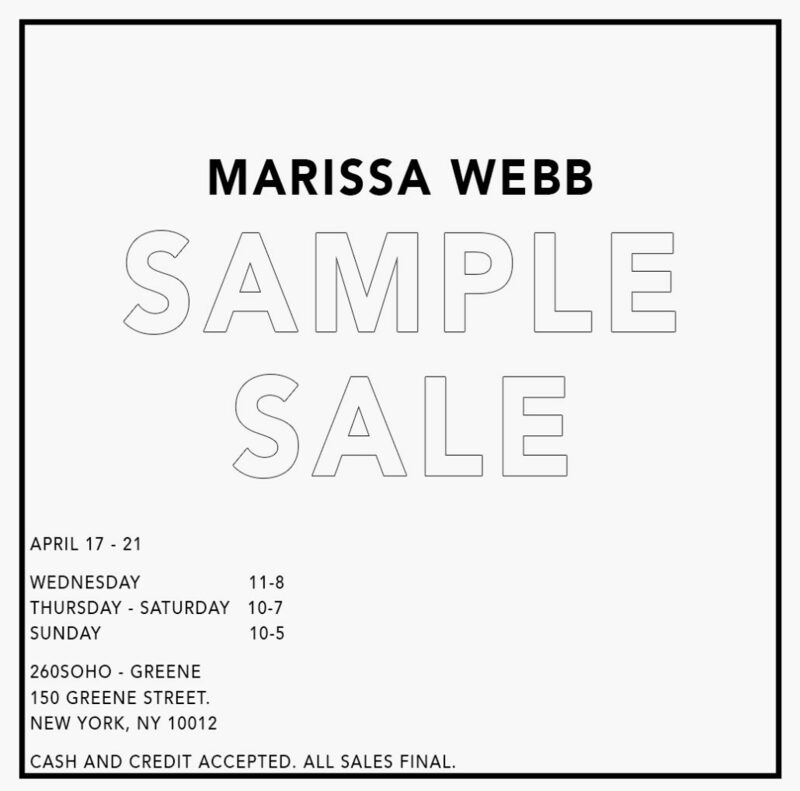 Are you excited for a particular sample sale? 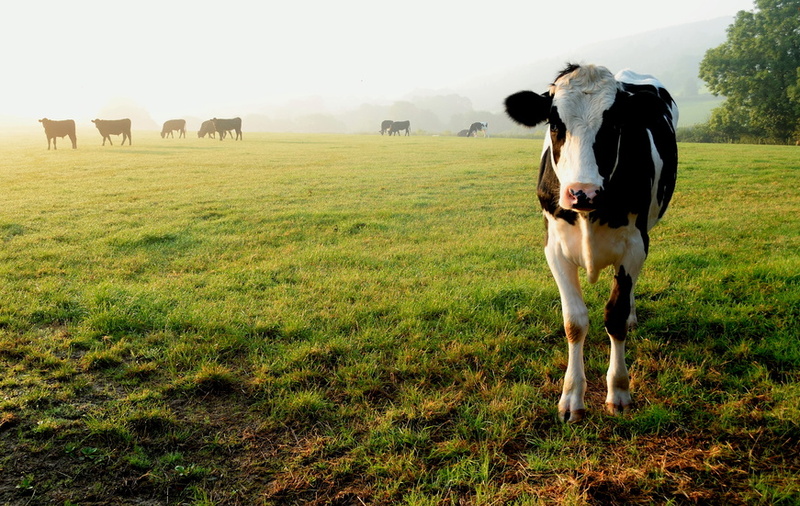 We’d love to hear which of the sales you’re most looking forward to. Mid-February saw the streets of New York City even fuller than usual as the Fall 2019 New York Fashion Week rolled into town. The timing was perfect, as style-minded people everywhere began to feel bogged down by the bleak winter landscape and needed a fashion boost. This year’s fashion week was certainly not short in inspiration for dull closets. Let’s take a look at the top Fall 2019 trends spotted on the New York runways to look forward to this fall. This year, designers have been embracing the rugged look in their clothing. The models on the runway were clad in soft brown leather moto jackets, trench coats, and jumpsuits. This look not only communicates a more down-to-earth vibe, but it attracts an audience who needs to work but wants to look fashionable doing it. As a neutral shade, brown is also simple to pair with almost any other garment or accessory, giving it a versatility many other colors don’t have. 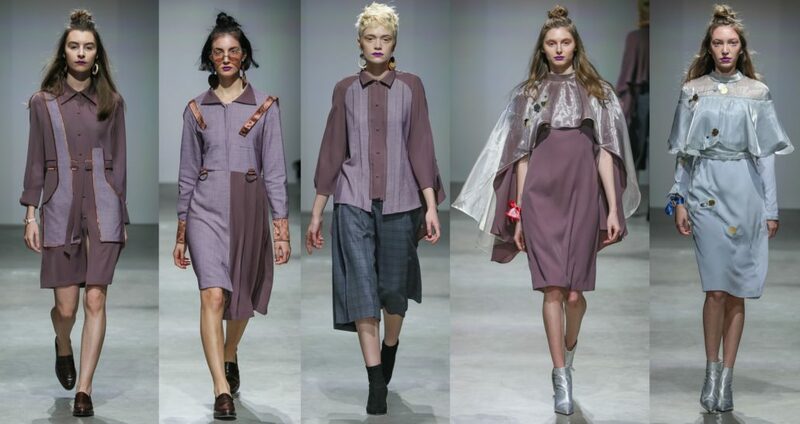 The nod to the construction industry and lovable earth tones was seen on the runways of several designers, including Veronica Beard, Jonathan Cohen, and Maryam Nassir Zadeh. A major trend in the footwear department is loafers. Yes, the classic menswear shoe that would clad the foot of a businessman or engineer. But you don’t have to earn the average engineer’s salary of between $50,000 and $150,000 or wear the stuffy suit of a businessman to get in on the loafer look. This year’s runways saw female models wearing the classic loafer with anything from elegant gowns to modern dresses. This trend was on the runways of designers like Carolina Herrera, Ryan Roche, and Oscar de la Renta. Not only does it offer an alternative to the classic dress-and-heel pairing, but it points to a bigger trend of prioritizing comfort in footwear. This year’s runways also saw ergonomic sandals, stylish mules, and block-heeled boots. Many designers this year threw the gender binary out of the window and instead asserted that people of any gender can wear their clothes. While the runways have been tending towards androgyny for years now, this year saw more male models in feminine looks, female models in masculine looks, and people who don’t identify with either gender in looks that were just fashionable. 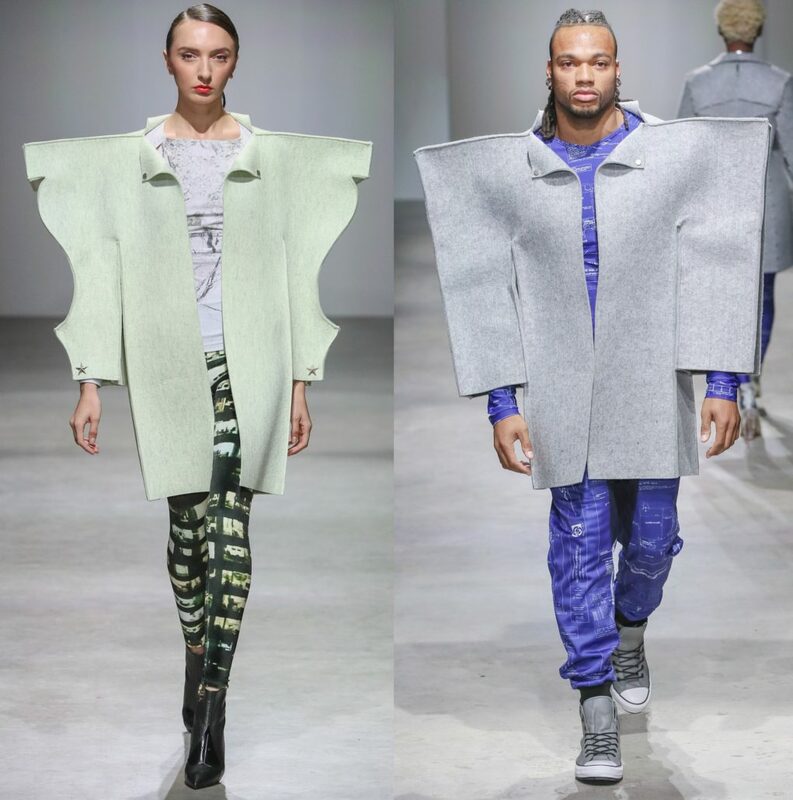 Collections from Alessandro Trincone and Bode took on the challenge of reframing typical masculinity. They styled their male-presenting models in soft hues, detailed makeup, and even ballet flats. On the other end of the spectrum, emerging labels such as Batsheva and Vaquera put their female models in high-necked dresses and oversized silhouettes that engulfed their figures to challenge the idea of femininity for the male gaze. What’s the ultimate takeaway from this year’s New York Fashion Week? This autumn, drape yourself whatever way fulfills your sense of identity, adorn yourself in comfort, dress for utility. Just do you, but make it fashion. What are your thoughts on these top Fall 2019 trends? For our second Nolcha Show, we attended the Acid NYC Fall-Winter 2019 Collection runway show. The label, co-founded by Evelyn Luna and Scott Chester, presented a men’s and women’s collection, called “Architectura”. 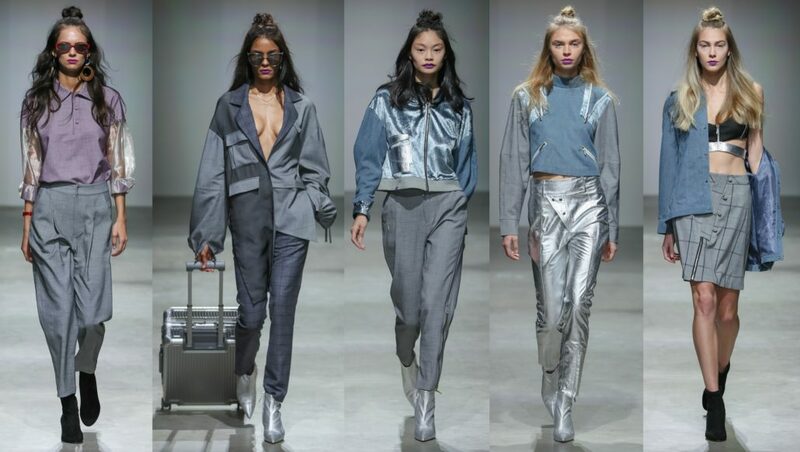 The collection was inspired by the beauty and structure of urban architecture, with prints and fabric choices that are a nod to modern metal, glass facades, and neoclassical buildings. We are going to concentrate on the women’s ready-to-wear looks but we will be highlighting one men’s look – you’ll see why. We must admit, we think this collection absolutely honors the chicness, fashion edge, skyline, and “no effs given” attitude that is New York. 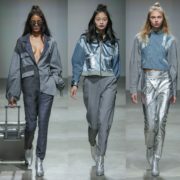 The prints and fabric choices from the Acid NYC Fall-Winter 2019 Collection were a study of modern metal and glass facades and neoclassical buildings with carved cornices of chiseled marble and cast cement. They analyze various building methods, how they reflect and emit light, and highlight the transformation that takes place from day to evening. There a lot to love from this collection. Their silhouettes are superb, the colors are striking, and the details and embellishments distinct. We also die for their accessories – turn your attention to those must-have bags. The collection used a mix of richly colored fabrics that reflect and react to light; like shimmering lame, silk charmeuse, stamped patent leather, and metallic lace. For contrast matte textures of organza, wool double knit, brocade, velvet, and heavy wool felt were used. Speaking of heavy wool felt, Acid NYC brought a bit of the avant-garde to their ready-to-wear collection with their oversized jackets. For this season’s event, the Nolcha Shows partnered with the Make-A-Wish Foundation for the second time. This season they grant the wishes of two young girls who shared a dream of being fashion models in NYC. 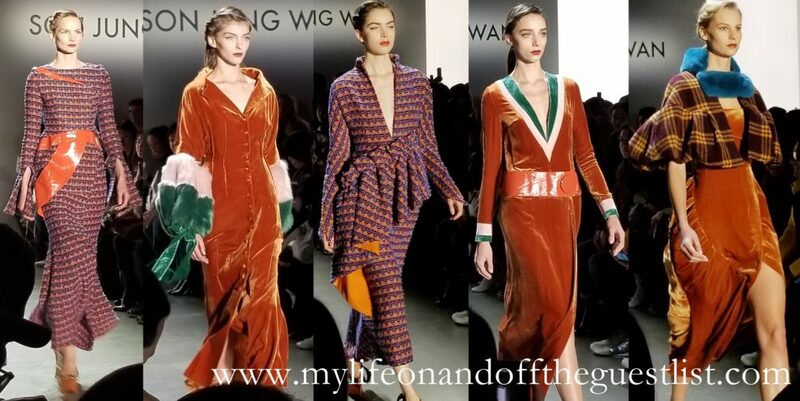 Together, they received a life-changing, behind-the-scenes experience at NYFW which included backstage hair and makeup treatment, being styled and dressed by this season’s designers including ACID NYC, sitting front row at the shows, and enjoying a personal photo shoot with a professional fashion photographer. The Acid NYC collection is designed and made in New York. We’d love to hear your thoughts on the Acid NYC Fall-Winter 2019 Collection. Days ago, the world lost fashion and design icon, Karl Lagerfeld. You’d be hard pressed not to know who he was, even if the world of haute couture is lost on you. As of 2017, there were more than 3.74 billion internet users in the world. Days following Karl Lagerfeld’s death, millions of those internet users who would’ve otherwise not know his name are learning about him. His presence, appearance, voice, and influence have rippled through the fashion world for decades. Now his death has left a void where once stood a Titan. In an extremely private battle with pancreatic cancer, the longtime creative director at Chanel passed away at age 85. His dazzling creative life changed the face and attitude of fashion as we know it and we’ll still — often unknowingly — be feeling the impact of his influential creative genius as it subtly flows down from luxury fashion houses to mass marketed apparel. 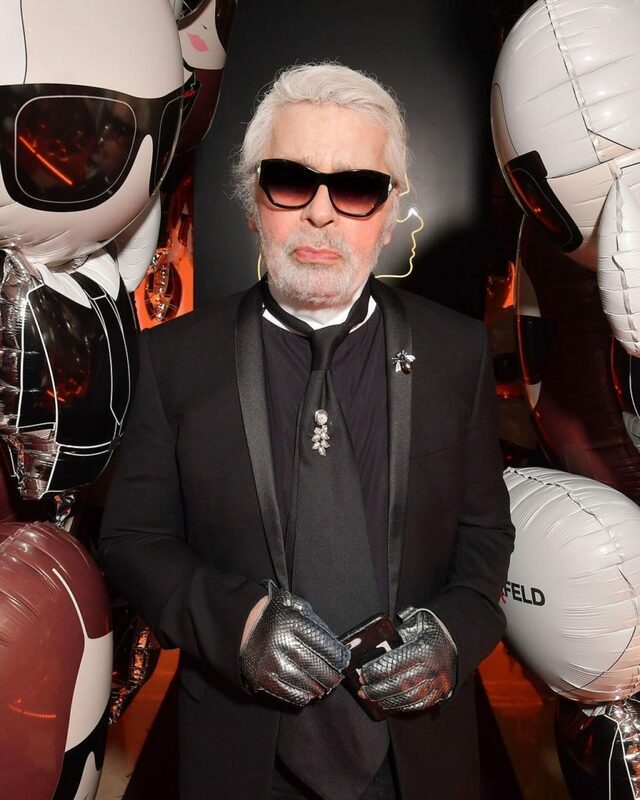 While 75% of internet users never scroll past the first page of search results, they’ll be seeing hundreds of Lagerfeld memorials over the next few weeks. And it isn’t difficult to see why. “When I was four, I asked my mother for a valet for my birthday,” Lagerfeld told Vogue. From his earliest life, it was pretty clear that Karl Lagerfeld wasn’t like everybody else. At an early age, Karl went to Paris where he began his life-long journey in the fashion industry. From Balmain to Chloe to Fendi, Lagerfeld made his mark on some of the most famed fashion houses on earth through the 1950s and 1960s. Then, he found his throne as the creative director for Chanel. “My job is not to do what she did, but what she would have done. The good thing about Chanel is it is an idea you can adapt to many things,” he said in reference to founding designer Gabrielle “Coco” Chanel. He proceeded to bring Chanel back to life after the fashion house had been long dormant. Chanel CEO Alain Wertheimer said that when Lagerfeld took the creative reigns, he told him to do whatever he wanted. Free creative reign. As it turns out, this would be one of the best decisions he could’ve made as Lagerfeld proceeded to revive and modernize the former glory of Chanel. When you make a name for yourself that large, all eyes are on you. A fact which he relished, regardless of the reactions he received. Lagerfeld was, while widely revered, not without a swath of controversy surrounding him. His quick wit, sharp tongue, and flippant attitude toward his own manner of self-idolatry were certainly central to his character. With him front and center upon the throne of a world revolving around image, he was unabashed to make sure that people heard what he had to say on things. And where many famous people in the spotlight choose their words carefully, Lagerfeld believed the exact opposite. “Be politically correct, but please don’t bother other people with conversation about being politically correct, because that’s the end of everything. You want to create boredom? Be politically correct in your conversation,” he said to Vogue. Reflected in a comment he made about abandoning his German citizenship when German Chancellor Angela Merkel decided to welcome a million migrants into Germany, whispers of xenophobia weren’t uncommon. Where the immigrants make up 13% of the U.S. population, Germany’s immigrant population is much lower, a fact that isn’t lost in the political sphere there. Also, a fact Lagerfeld felt the need to offer his opinions on. From the political sphere to every and any aspect of the fashion world, Lagerfeld didn’t censor himself. Something that many didn’t like, others feared, and masses respected. Who fell into which category among those who had opinions about Karl didn’t matter. Why? He simply couldn’t be bothered. Lagerfeld was never shy about speaking his mind. Widely regarded as one of the most quotable people in the history of fashion, his nuggets of sharp-tongued “wisdom” still permeate. He was notably quotable in the way he spoke of (and lived in) absolute luxury. If it did not sparkle, he would not have it. This attitude spanned his whole existence and contributed to his outlook, as well as his personal look. 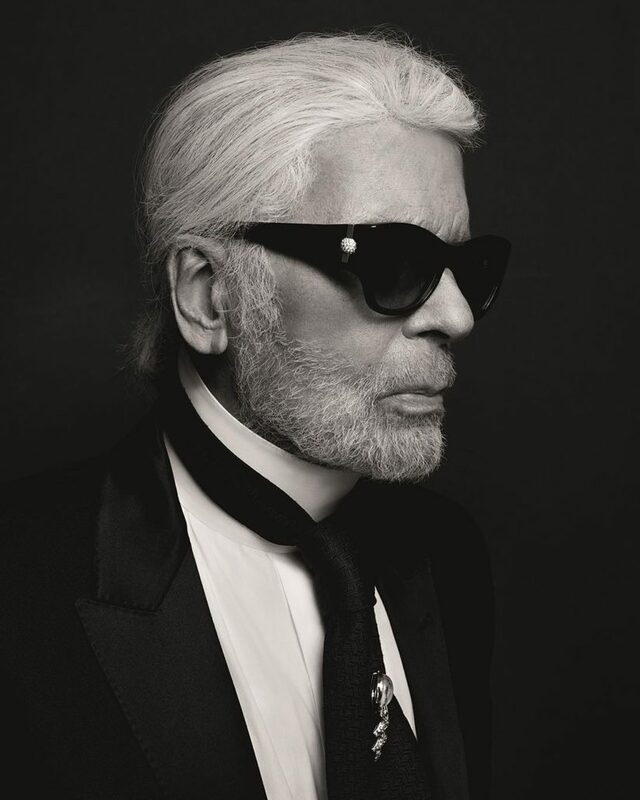 He himself dressed the part in an unmistakably Karl fashion. Dark sunglasses, silver ponytail, fingerless gloves, and suits with incredibly high collars. The entire fashion world is still paying tribute to his legacy and his seat at Chanel’s creative helm will be taken by the director of Chanel’s Fashion Creative Studio, Virginie Viard, reportedly Lagerfeld’s closest collaborator of over 30 years. Rest in peace, Mr. Lagerfeld. Our first fashion show from the Nolcha Shows showcased a mix of men’s, women’s and children’s ready-to-wear but we’re concentrating on the womenswear. Founded by Lujin Zhang, Zampano Lin, Yokiri Qin and Yanting Zhao in 2018, Unwonted is affordable limited high-end clothing. We had the pleasure of attending the Unwonted Fall-Winter 2019 Collection, which was inspired by “Balance”. 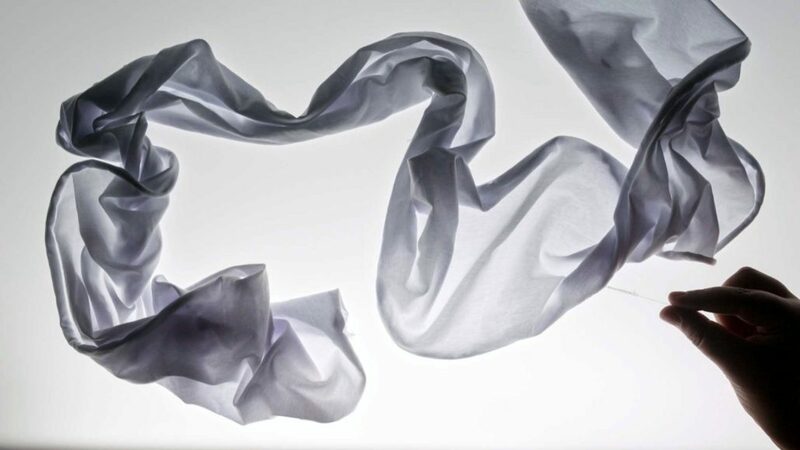 Inspired by the “Balance” shown in the intimate relationship between materials and cut, including wool, velvet, organza leather, silk, and corduroy. 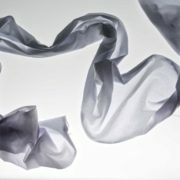 Fabrics were deconstructed and resembled in different ways resulting in designs that could be dressed in various ways. Unwonted’s designs embody balanced aspects of yin and yang in (inspired by) Taoism. This philosophy believes balance leads to beauty in harmony while imbalance leads to destruction in chaos. With Unwonted, the designers strive to create harmonious designs using the philosophy of balance. The color palette for the Unwonted Fall-Winter 2019 collection boasted earth tones with splashes of bold color including chocolate, greys, bean, dusty rose, black, blue, white, purple, celadon, and emerald green. Fabrics used include wool, organza, tulle, velvet, and corduroy. Design details include asymmetrical silhouette, topstitching, embroidery, beading, patchwork, and pleating. Apart from making their collection of affordable luxury, only 100 pieces are released per design. All of Unwonted’s pieces hold one-of-a-kind looks while embracing dresser’s unique personality and attitude. This allows a balance between the clothing and dresser themselves. Each with a unique number engraved to ensure quality and exclusivity. Some of our favorite pieces include a Dusty Rose dress in a double-layered yarn silhouette with sleeves with beaded patches; a Cave Pearl double layered tulle dress with long sleeves; Dark Grey/Light Grey woolen jacket with contrasting light grey pockets and Dark Grey plaid close-fitting zippered pants; and a Blue/Silver/Grey short zippered velvet cardigan jacket with corduroy sleeves and asymmetrical patent leather pockets with plaid zippered pants with slanted pockets and silver embroidered pockets. They usually say too many cooks spoil the broth but in the case of this multi-designer label, it only enhanced the collection. What are your thoughts on the looks from the Unwonted Fall-Winter 2019 Collection? How appropriate that Valentine’s Day is mere days away and we’re reviewing an NYFW collection named “Romance Returns”. 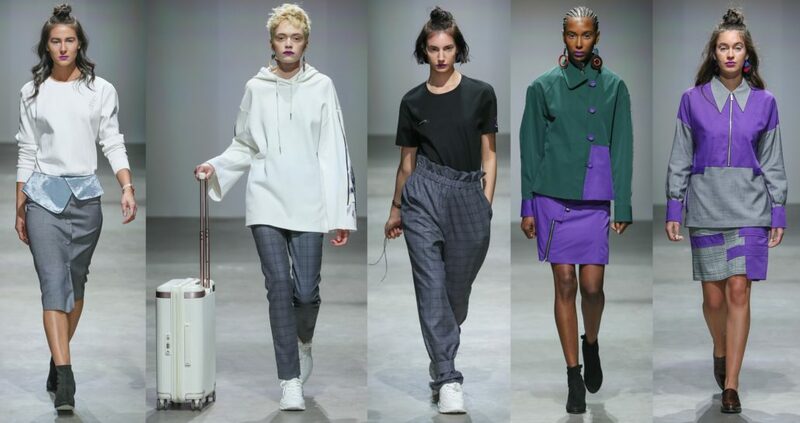 The Son Jung Wan Fall-Winter 2019 collection was inspired by the “romantic mood of retro art and culture. 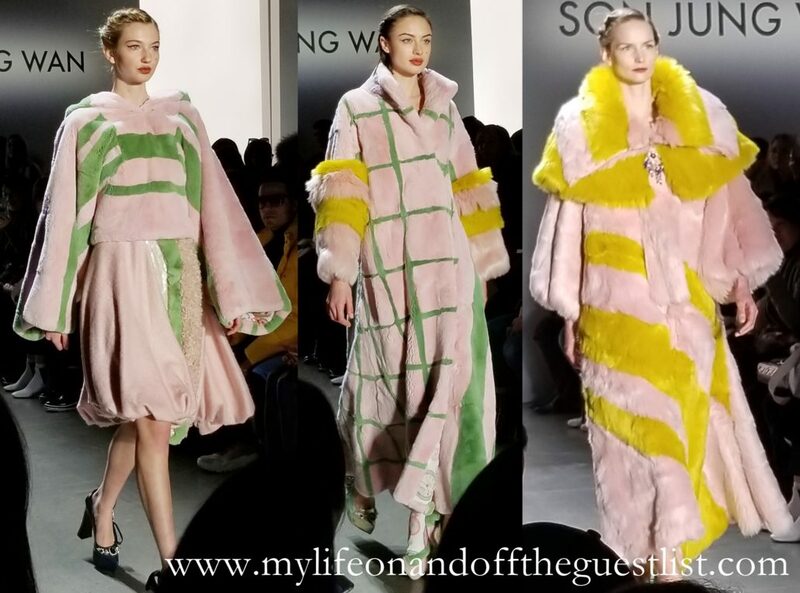 With this collection, Son celebrates her love of luxurious fabrics, softness and femininity, and unconventional use of color, silhouettes, and textures. 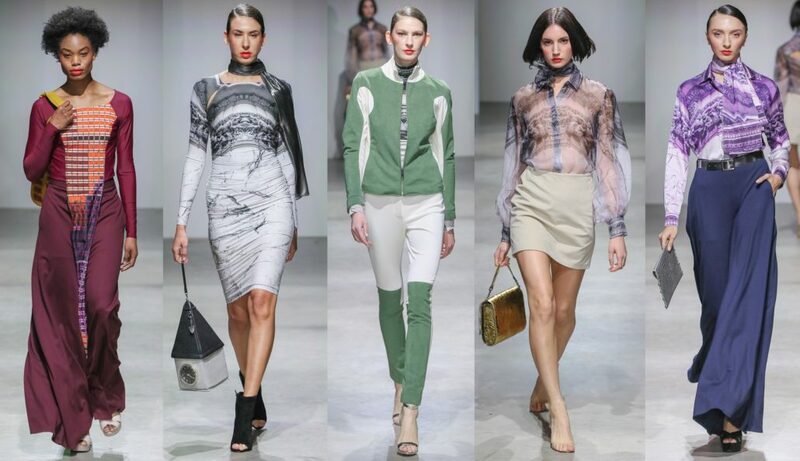 All of which are key elements in this season’s collection. 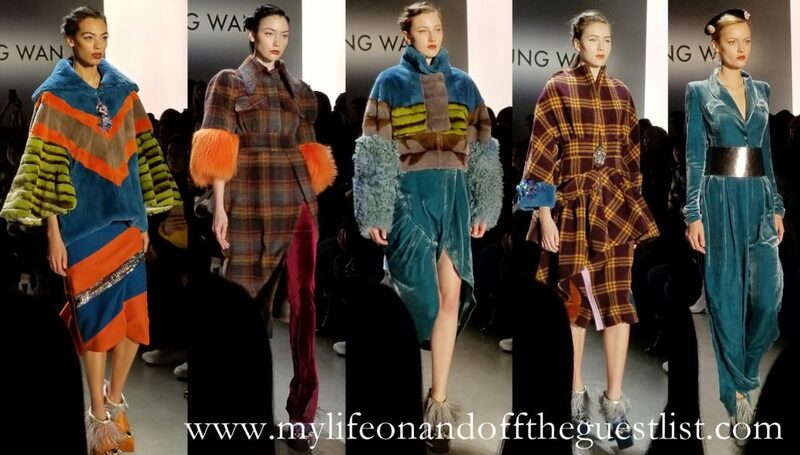 The Son Jung Wan Fall-Winter 2019 collection featured mixed faux fur, bold prints, sequins, velvet, ruffles, and embroideries in the bold colors to create a romantic mood full of playfulness. The color palette boasted a combination of bold, dark, and pastel hues. Bold, striking colors included Orange Pepper, Placid Blue, Sulphur, and Spring Crocus; light pastel colors included Harbor Gray and Potpourri; the addition of dark colors such as Adobe, Windsor Wine, and Peacock created a uniqueness to the visual feast that was the collection. 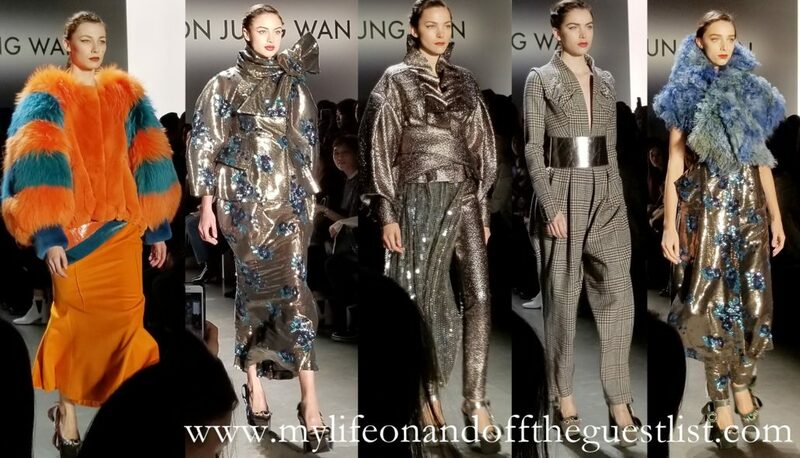 For fall/winter Son Jung Wan fully embraces the idea of romance, with an emphasis on softness and a futuristic touch. A lot of emphases was placed on the mixing and matching of different fabrications and colors. The idea was to illustrate and perfectly capture the retro feel, which of course, the collection does. 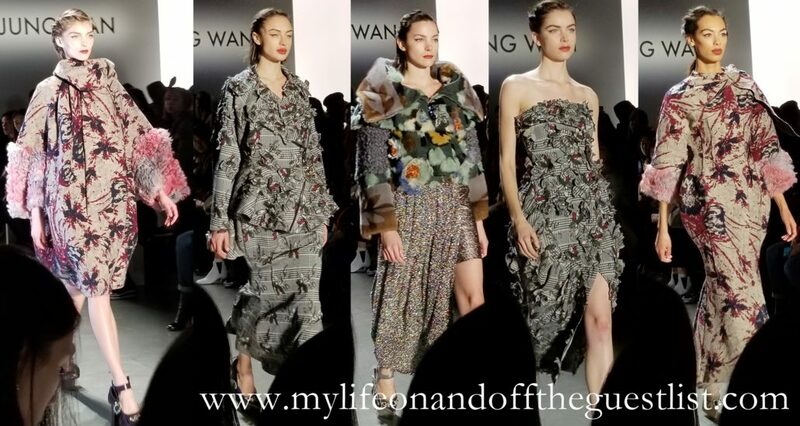 For Son Jung Wan, the fabrics alone weren’t the only important factor. Placement and juxtaposition of the different fabrics to create unique pieces was a driving force the looks. 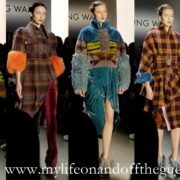 Fabrications used in the collection include faux fur, checkered prints, flower prints, embroidered fabric, sequins, and velvet. 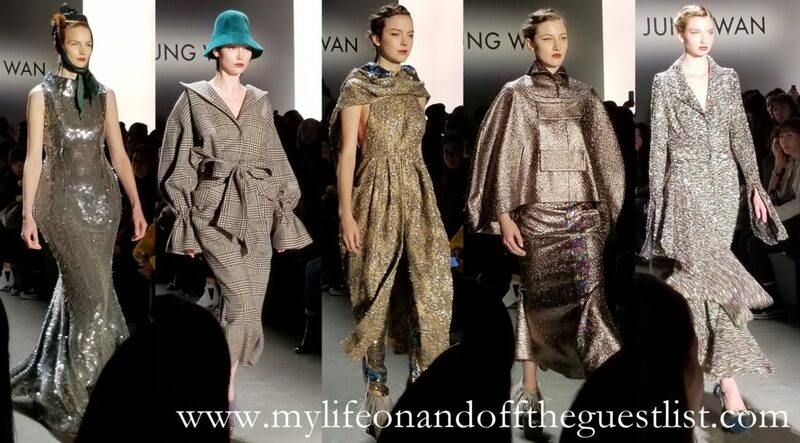 We applaud Son Jung Wan for bringing romance back to fashion and her use of exaggerated silhouettes and bold colors. 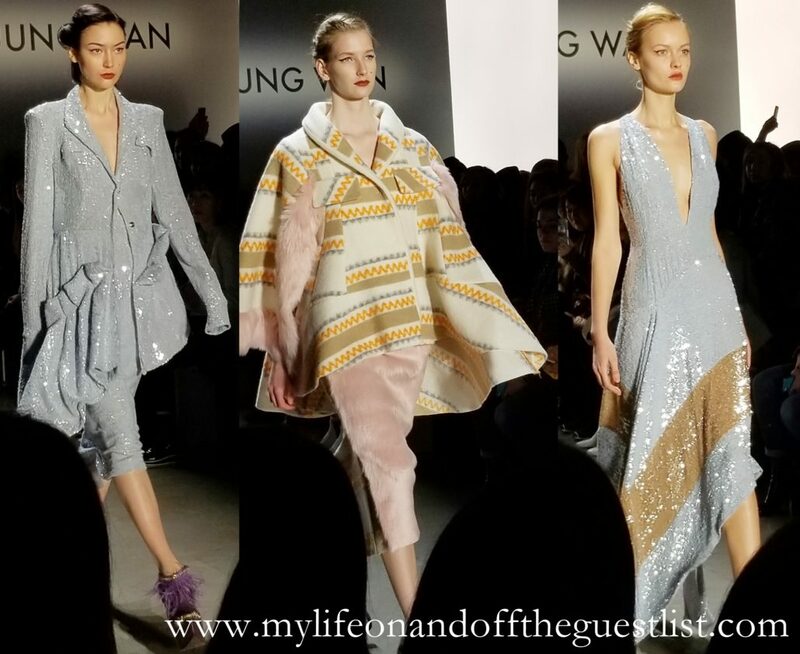 We’d love to hear your thoughts on the inspiring Son Jung Wan Fall-Winter 2019 collection. What do you think of her bold color palette or her mixing and matching of materials? Share your thoughts in the comments below.